Kanji Go lets you search for words by entering Kanji, Kana, and English. 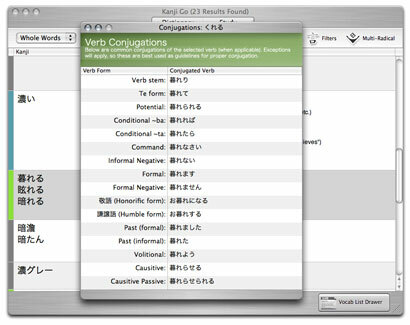 To type Kanji and Kana, you'll need to enable typing in Japanese in OS X, or if you're just starting your Japanese studies, enable Romaji display from Kanji Go's View menu. Set the Search Style: The drop down menu next to the search field lets you specify how you'd like to search. You can change the language results are shown in via Preferences (cmd ,)- the English and Deutsch dictionaries are the most comprehensive, though many entries are also avialable in French and Russian. Whole Words: Shows entries that contain the inputted word in their Kanji, Kana, or English field. A search for test would return entries like 'test' and 'a standardized test to measure ability'. Contains: Shows any entry who's Kanji, Kana, or English definition contain your search criteria. A search for test would return entries like 'test' and 'attest'. Begins With: Shows any entry who's Kanji, Kana, or English definition that starts with your search criteria. A search for 'mid' would return entries like 'middle' and 'midnight'. Ends With: Shows any entry who's Kanji, Kana, or English definition that ends with your search criteria. A search for 'set' would return entries like 'closet' and 'offset'. 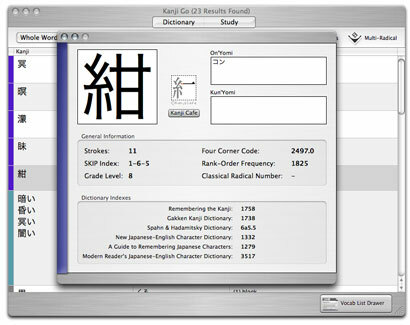 Stroke Count: Shows any Kanji that (when written in the standard manner) would take X strokes. For example, searching for '2' would display entries like 'hito' and 'juu', the Kanji for person and the number ten respectively. SKIP Index: Shows any Kanji that have the specified SKIP index (ex: 1-2-2). You can learn more about the SKIP look up method here. Applying Search Filters: To narrow down a search, you can filter results according to the # of Kanji, # of Kana, and/or Part of Speech. To access the Search filters, click 'Filters' on the Study tab. As long as the Filters drop down is visible, it will be applied- clicking the Filter button a second time to hide the Filters will disable them. # of Kanji: The number of Kanji contained in any of the word's Kanji definitions. Non-Kanji characters in the Kanji field of a word are not counted towards this number. Clicking the equals sign will cycle through '<','>', and '=', granting additional flexibility. # of Kana: The number of Hiragana and Katakana characters contained in any of the word's Kana definitions. Non-Kana characters in the Kana field of a word are not counted towards this number. Clicking the equals sign will cycle through '<','>', and '=', granting additional flexibility. Part of Speech: Noun, Ichidan Verb, Expression, etc. Many words have multiple parts of speech and will appear under different filters. Search within Results: Searches within the currently visible search results (ideal for narrowing down a broad search). For Kanji whose reading or stroke count aren't clear, you can also use the visual multi-radical method to find it. You can access the input panel by clicking 'Multi-Radical' on the dictionary tab. On the panel that appears, click on any combination of radicals to see Kanji which contain all of them. Verb and Adjective Conjugations: If a row in your search results or a vocab list is marked with light green or turquoise, you can double click that row to view conjugations of that verb or adjective respectively. 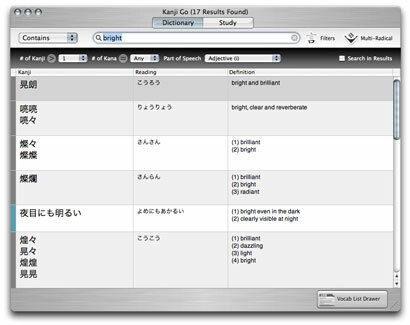 Kanji Information: If a row in your search results or a vocab list is marked with purple, you can double click that row to view additional information about the Kanji, including its Readings, Stroke count, Stroke order, SKIP index, and various Dictionary Indexes. You can also change the language of search results- see the section on Customizing Kanji Go for more details. Get more out of your searches by adding results to custom vocab lists for later review.